My neighbours just installed solar panels. That’s not the kind of thing that should arouse jealousy, but it does. I’d like to do it too, given a few changes in our circumstances. But I started to wonder why they’d done it, and why we wanted to. They’re certainly not alone – in the last year, especially, there has been a real rise in the number of panels installed, with over 100,000 installations in 2013 alone, more than doubling the total previously installed. The uptake of panels has been fairly recent, and influenced by subsidy programs, though not always in the way you’d expect. There was a subsidy program in place from 2008 to 2010. It was a payment of €0.33 per kilowatt hour, and didn’t seem to have led to a lot of uptake, looking at the graph above. However, its cancellation seems to have done a lot more good. 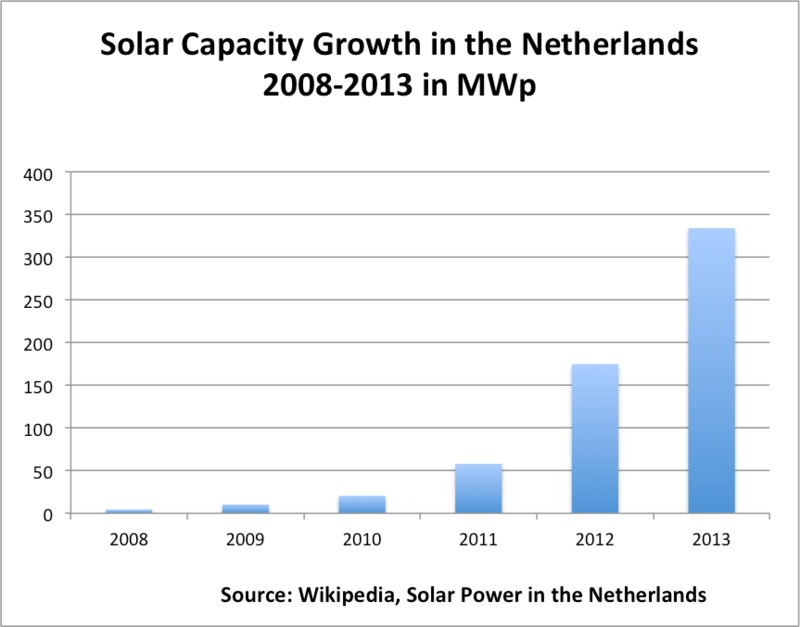 That cancellation led to an organization called Urgenda taking action – they started Wij Willen Zon (We Want Sun) which organized bulk purchases of solar panels from China between November 2010 and May 2013 and really jump started installations in the Netherlands. They’ve decided they’ve accomplished their goals and have stopped the program, but have been followed by other groups offering similar programs. 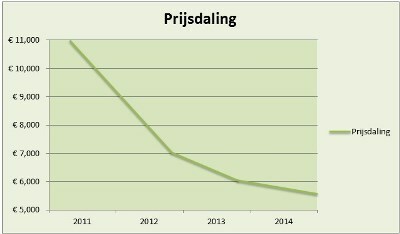 The other subsidy, which did have a big effect, was negotiated in 2012 by GroenLinks (the Green Left party). It was a 15% subsidy on solar panel materials, which led to 90,000 installations. But that pot of money was used up, and there are no current subsidies, though you can now get the 21% VAT back (which is more than the subsidy was, though might not feel the same psychologically since it’s not “free” money) and some cities offer low cost loans for energy efficient changes, including solar panels. 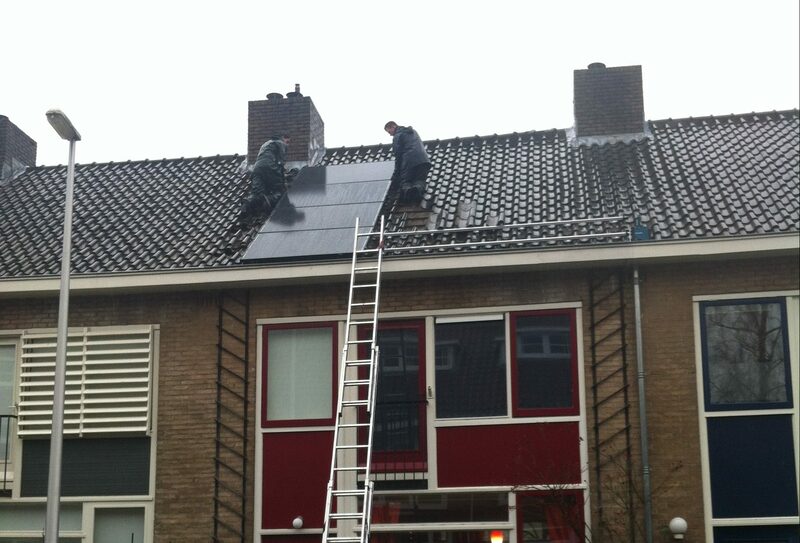 But, even without the subsidy, people are still installing panels, like our neighbours, so there must be reasons. There is also some research that adding solar panels to the house is thought to increase its value, meaning that even if you move you are likely to at least get your investment back. And the cost of panels has come way down – at the end of 2012 it was half what it was in 2010, as you can see. Plus, it’s certainly not difficult to get the panels installed, with lots of private companies providing the service – for my neighbours it only took a day for their house to become solar powered. 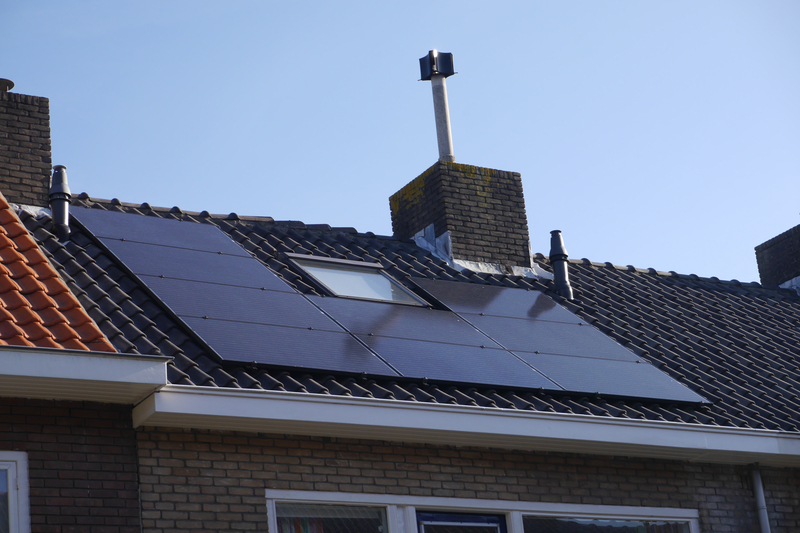 But while all of this reduces the barriers, it’s still a stretch to say that installing solar panels is the must-do option in the Netherlands. It is financially responsible, but only in the long-term, and short-term rewards are small, as theoretically money saved on electricity should be fed back to the savings or loan that financed the installation. And, any excess electricity fed back into the grid is paid for, but only at the rate the electric company gets for their electricity, not all the taxes and fees that make up the bulk of the bill, so the solar panel owner is paid out at 6-7 eurocents per kW rather than the 21-3 eurocents or so that the electric company charges. The problem is that I know that it’s been clearly demonstrated that most people discount future earnings and savings, so it didn’t seem to me that these financial reasons would be persuasive on their own. After all, there are a lot of other smart financial decisions that people don’t make. All of this led me to the hypothesis that the people who install solar panels are those who want to so primarily for other reasons, whether for their environmental benefit or the independence it provides from energy companies and rising energy costs. The financial benefits then provide a justification for doing something that was desired anyway, and since they seem the most logical, those are the reasons we talk about. And seeing the panels sprout up all around is also convincing – naturally all those other people can’t be wrong! There are now an estimated 162,000 installations, 70% of which are on private houses. A few very rough calculations give the estimate that 3-4% of single-family houses have solar panels. And, in a relatively well-off residential neighbourhood like ours, there’s certainly a sprinkling of them to be seen, which influences others thinking about installation. And there are other nudges – in the case of my neighbours, there was a direct nudge: the guy was offered a deal on panels through his employer, which caused him to do the research (and ultimately to go with a different provider). But I don’t think he would have gone to the trouble of doing the research if he hadn’t thought it was an interesting idea already. And there is some proof for these other motivations, since as it turns out, a study by Ecofys and Wageningen University found that people who are already saving energy are more likely to install solar panels. What was also interesting about that study was that people who have installed the panels are then more likely to further reduce their energy use, which points even more directly at desiring environmental good as a motivation. If the primary motivation was financial, I think we’d be more likely to see the rebound effect the study expected, with people upping their use to reflect lower costs. And in Australia in 2009 they found that 53% of solar panel households installed the panels in order to reduce their carbon footprint and 43% wanted to increase renewable energy generation in Australia. Only 19% wanted to decrease their energy bills. Which means that perhaps those who want to promote the use of solar panels should profile families who have installed them, and show how happy they are with them and how they like doing good environmentally and how they like being free from energy companies, with the financial information available to help finalize the decision. Initiatives like The Hague’s Gluren bij de Groene Buren (Peeking/Snooping at the Green Neighbours) or Solar Days are good examples. Of course, all of this reasoning applies only to the Netherlands – in other places, notably Germany, the motivation for installing solar panels is very different. In Germany, as in a few other countries, the government has used feed in tariffs to very successfully jump-start a solar industry. A feed in tariff is a guaranteed price for energy that is fed back into the grid, with the intention to help offset the cost of installing the technology – increased costs are fed back to consumers through a surcharge on energy. 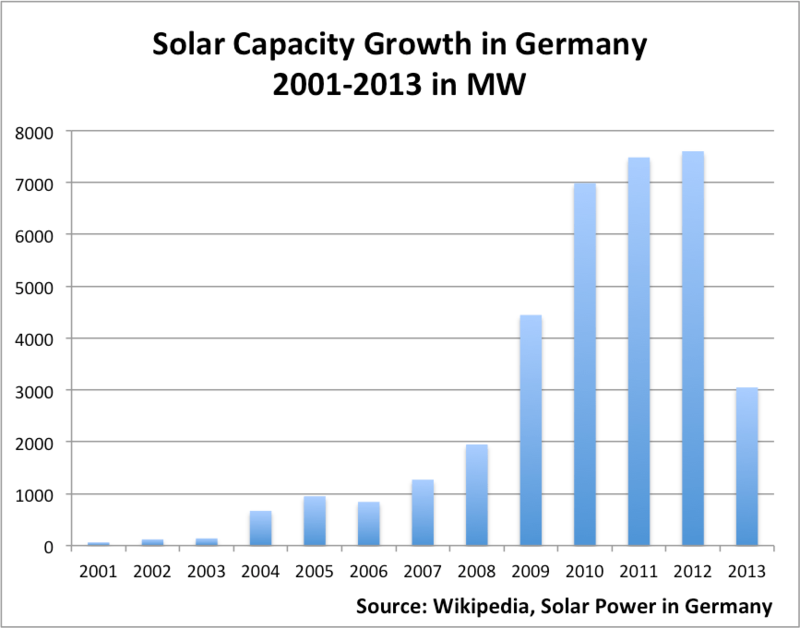 This strategy led to solar capacity shooting straight up in Germany and a lot of people looking to them as an example. But there is now some backlash from consumers against the raised tariffs, and with the decreased cost of panels (which was in fact one of the goals of the program, to reduce the cost through providing a big market), the feed in tariffs were reduced to 66% of previous levels for the third quarter of 2012. Although that year still saw a record number of installations, most of those were in the first three quarters, and 2013 saw a sharp decrease. There is even the question of whether the guaranteed feed in tariff is still needed, and if so, at what level, as the reduced cost of panels leads to grid parity. 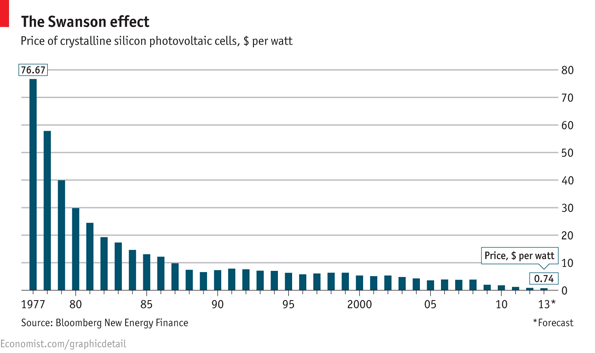 And the case of Spain is somewhat cautionary – they also tried the feed in tariff but had to cancel it prematurely and retroactively in 2008 with the crisis, leading to angry investors who won’t be able to make a profit. Other countries have done it somewhat better, and in some places, like Italy, solar panels can actually stand on their own as an energy source. Given these different histories, it would be very interesting to do a comparison of the owners of solar panels in the Netherlands and Germany, both their motivation for installation and their energy use after installation. 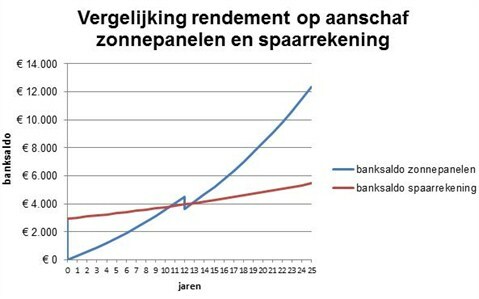 If those in Germany are more motivated by what they can earn, would a rebound effect be found or would people want to maximize what they earn back from the grid by using less, or would they have the same motivation as the Dutch? If the feed in tariff is lowered more or abolished, will people continue to install solar, or will it seem that it isn’t worth it any more without the earnings that can be made from it? It will also be interesting to monitor people’s energy behaviour as solar panels become more and more common. I would imagine that as they become more common, they’ll start being installed by those with less environmental/independence motivations – will there be a rebound effect among those people? Or will they internalize the idea that through the installation they are more environmental, and start to change their other behaviours? In any case, having done all of this research, I’m reconsidering our hesitation to install the panels, and we may yet become a statistic of being influenced by the neighbours to do what we want to do anyway. If you’re in the same boat and are in the Netherlands, here’s a good list of things to keep in mind. Update: We did get solar panels in January 2015.